It’s a rainy Sunday afternoon with no clear skies in sight any time soon. Why not invite over a friend and play some local multiplayer games together? If you’re worried you don’t have a PlayStation or Nintendo Switch, you shouldn’t be! 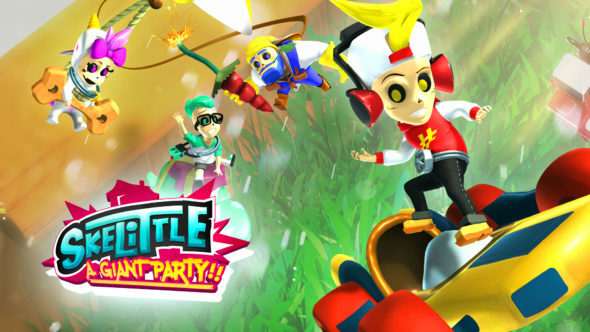 Skelittle: A Giant Party is a funky party game available on Steam, possibly giving players a great couch gaming experience. Let’s take a closer look. In Skelittle: The Giant Party we meet the Skelittles. These are nasty little toys who escaped from their cereal boxes. Now that they’re free, they want to take control of the house. Your everyday environment will turn into a gigantic playground for these little guys. As you can tell, there’s no elaborate story behind this game, and that’s perfectly fine. You play a party game for the sake of having a little fun so adding a big background story wouldn’t bring any added value to Skelittle: A Giant Party. At the moment, there are four characters available to choose from. Each one has its own unique look, but they’re all little skeleton creatures. You have Alfred, who looks like a plumber, Tag, a cool teenage boy wearing headphones, Lea, who seems to be wearing a unicorn onesie, and Tim, who looks a little like a green-haired nerd. The whole game uses 3D graphics and has a cute vibe. Both the characters and the environments have a playful and cozy look. While playing a series of mini-games, you’ll get to enjoy a fun soundtrack, fitting the atmosphere of the funny game perfectly. As the developers described it themselves, the soundtrack is a groovy mix of funk, rock and fusion. Besides the music, there are also sound effects fitting various situations. For example, during one of the mini games, you have to avoid pistons that heat up and you’ll hear the sound of them heating up. Skelittle: A Giant Party is a party game. So far, it includes 13 mini-games, but the developers are planning to reach 20 or more mini-games for the full release. You can play with 2 to 4 players, making it a local multiplayer game. Both your keyboard and controllers can be used, though only one person can use the keyboard so you’ll need extra controllers. All mini-games take place in your everyday environment. 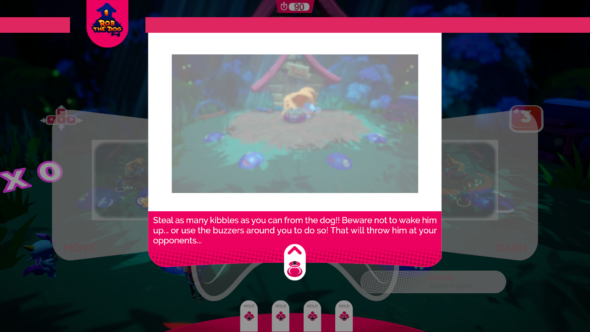 In Rob the Dog you’ll have to try and steal as many kibbles as you can from the dog sleeping in the garden. If he wakes up and grabs you, you loose the kibbles you gathered. You can also choose to wake him up by using the buzzers, which comes in handy if you want to thwart your opponent(s). The player with the most kibbles when time’s up, wins. 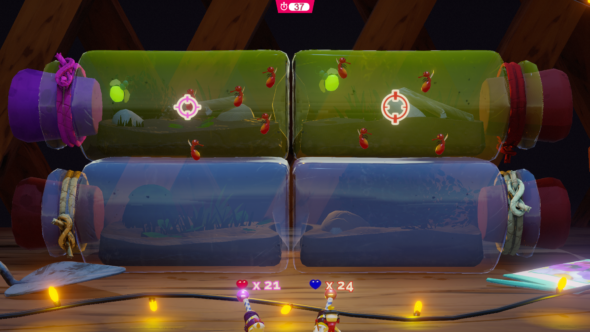 In the mini-game Midnight Hunting you have to shoot as many mosquitos as possible. There’s one green one you can’t shoot or all mosquitos will leave for a short while. Again, the player who shoots the most mosquitos, wins this round. All mini-games have their own thing going on, but mostly the same controls are used. This makes it easy for players to remember the controls. 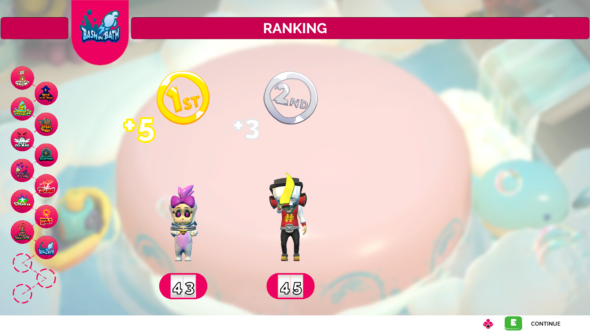 Points are rewarded to the players at the end of every mini-game, and the rankings are shown. At the end of all mini-games, there will also be a ranking showing who won with how many points. This makes it a competitive game but in a funny way. The task are often weird and will make you laugh, making this the perfect game for a rainy day. There’s also a leveling system. When you play mini-games, you earn XP. The more you play, the more XP you’ll earn and this comes in handy. Leveling up earns you new items. You can for example unlock a fooseball and soccer cages. These items can then be used in the Sandbox mode. In this mode you can design your own game session. Use the items to personalize the Skelittle’s liar. So far, Skelittle: A Giant Party is a fun party game already. The mini-games put you in crazy and inventive situations. Currently, the developers are working on adding AIs. This seems like a very important adjustment to the game. Right now, the game is only playable if you’re with friends, which is a shame. Of course, it’s a party game to enjoy with friends but by adding AIs, and thus making the game available for single players, would open up its audience a lot more. Besides this, adding an online multiplayer besides the local one would be very welcome. Sometimes it’s just not possible to meet up with friends but people do enjoy gaming together nevertheless. An online multiplayer mode would help these types of gamers. 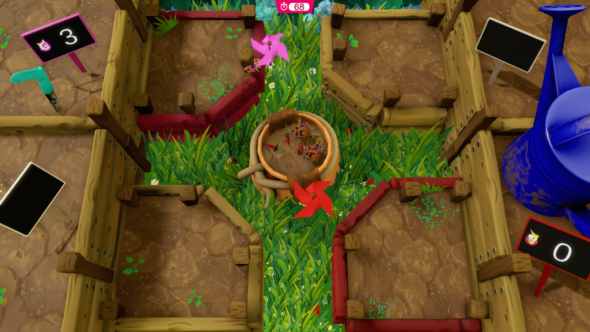 Skelittle: A Giant Party is still in Early Access but already shows potential. We hope more crazy ideas are turned into new mini-games, along with some new characters to pick from. Both the graphics and soundtrack are already on point, it’s just the gameplay that needs some polishing and upgrading. An online multiplayer and an AI mode would be a welcome addition, as well as a few extra mini-games. All in all, there’s not really something negative you can say about this game, making it worth your while to check it out and try it out with a couple of friends.